Create lists of your files. Is there a better alternative to File List Export Lite? Is File List Export Lite really the best app in Productivity category? Will File List Export Lite work good on macOS 10.13.4? 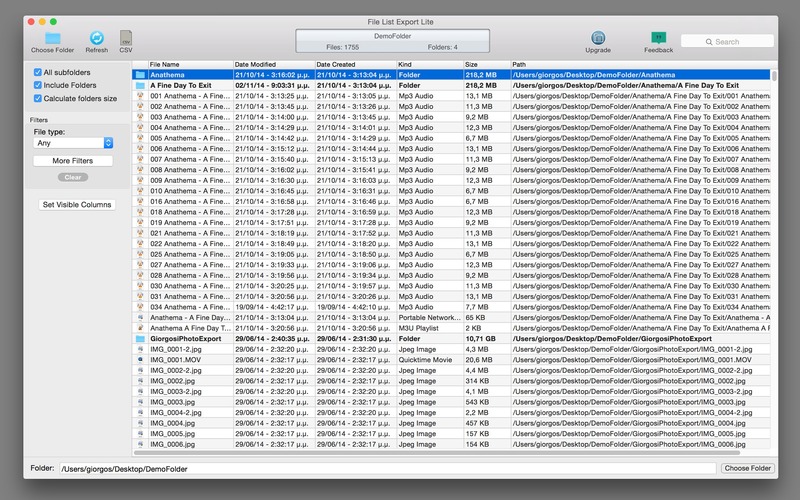 File List Export Lite will help you create list of files for any need. List all your photos, all your videos, or all your files. If you need to create list of files this app is for you. Just select a folder and get a list with all files and folders. You can sort, filter, edit the files and then save the list to a CVS file. You can choose if you want to include the files from all subfolders. Preview the list before export to file. You can select a specific kind of file to list. For example, you can choose to get a list with all the audio files of your iTunes Music folder or all the PDF files from your Documents folder. File List Export Lite needs a rating. Be the first to rate this app and get the discussion started!